Each day, many of us spend countless hours and devote a great deal of mental attention to what we see happening online. While much of this time may be useful, functional, practical, and enjoyable (You are reading this article right now online, right? ), many aspects of this online trend are not useful to us or are actually bad for us. As a psychologist, I’ve seen online behaviors increasingly becoming part of what my clients want to address while they’re in therapy. For example, I frequently hear how individuals’ phone use habits negatively impact emotional intimacy with the people in their real lives. Others describe how checking up on others’ posts on social media has had negative consequences on their self-esteem. Some people report difficulty focusing or meeting deadlines because of time they have “wasted” online. In a 2018 Pew Research Center survey, 8% of teens say they often lose focus in school because they are distracted by their smartphones. The survey also found 15% of parents report a reduced attention span at work. 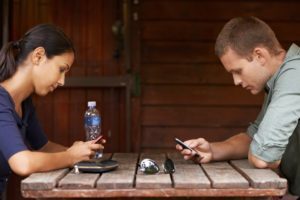 Over 36% of parents and 54% of teens believe they spend too much time on their cellphone. It’s easy enough for any of us to experience these issues. It’s important to both acknowledge when internet use causes problems and to recognize that it does NOT have to be this way. For those looking to address their concerns and develop a healthier relationship with their online behaviors, I have compiled the following pointers. When and how often each day are you online? What types of things are you doing online? Which activities cause you to lose track of time? Do online distractions get in the way of your productivity? Do your online activities interfere with your home life or your social life? Do you feel in control over your online behavior? What is your mood usually like when you go online, and does it change after you’ve been online? As you reflect on these questions, you may notice consequences to your online behavior that you didn’t see before. Are there any patterns you see that you would like to change? Once you recognize your online behavior, you may find it easier to acknowledge the emotional impact the behavior has on your life. This emotional impact may vary from day to day or between different situations. For example, over half (56%) of teens in the Pew Survey report feeling anxious, lonely, or upset when they think about not having their cell phone with them. These are powerful emotions. Can you relate to this? Are you going online to avoid something else that you need to do or that feels daunting? Are you trying to calm or re-calibrate your emotions? Do you tend to go online to feel better? Does this coping strategy serve you right now? Now that you have a better understanding of the role the internet has in your life, you are better prepared to make the changes you would like to see. Likely your motivation to do so has increased as well. We are more likely to adopt and maintain behavior change when we are kind to ourselves throughout the process.Many of the strategies for making changes involve altering your behavior. You can experiment with any number of rules or reward systems. For example, you could reconfigure your computer and phone to be less prone to distraction. This may mean blocking push and other automatic notifications for your apps. You might try blocking or hiding access to the distracting apps or websites. You could also close out of your email accounts when you are not using them. There currently are many products available for monitoring online usage. Going online is often a necessity in modern life, and there are infinite distractions when we go online. It can be so simple to fall into patterns that are not serving us well. But instead of examining these behaviors with self-criticism, try out self-compassion. We are more likely to adopt and maintain behavior change when we are kind to ourselves throughout the process. It’s OK that you have fallen into these patterns. You have the power to change them. When you identify something that is not working for you, consider what you would rather see instead. Understand that whatever had not been working for you can serve as a guide for you in the future. If you would like support during this process, you may wish to find a therapist. Therapy is a safe place to get help without judgment. Much needed article for today. Changing the environment is important and useful advice.